This post isn’t so much a recipe but more of harvest preservation. I enjoy canning my produce from our garden but sometimes I do run out of shelf space for the glass jars. This Spring I took the plunge and bought an Excalibur Dehydrator. I have wanted one for years but wasn’t sure. I ordered the 5 tray version. Now I wish that I had ordered the larger 9 tray. SIGH. Well, hindsight is 20/20. LOL! Believe me, if you think you want a dehydrator, whatever brand it is, buy the bigger one. You won’t regret it! The first photo in this post is today’s harvest. 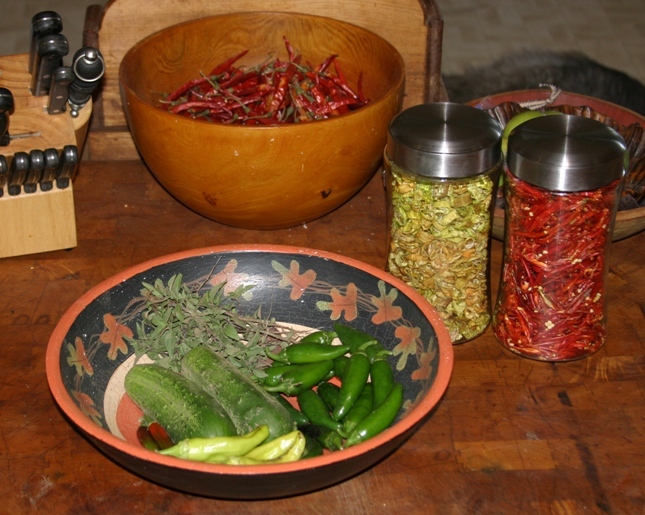 It’s small due to harsh weather we had this summer but you can see the two jars of dried peppers that is the result of many small harvests. Each small harvest can be dried and it will add up to a lot of tasty additions to winter meals. The yellow peppers are sweet banana peppers. That jar equals 5 gallon storage baggies of fresh peppers. The dried red peppers are a mix of cayennes, red serranos and red jalapenos and it equals 8 gallon baggies of fresh peppers. These red peppers will be ground to a fine powder to use on the table and it will be an ingredient into our “Fuzz’s No Salt Cajun Blend”. 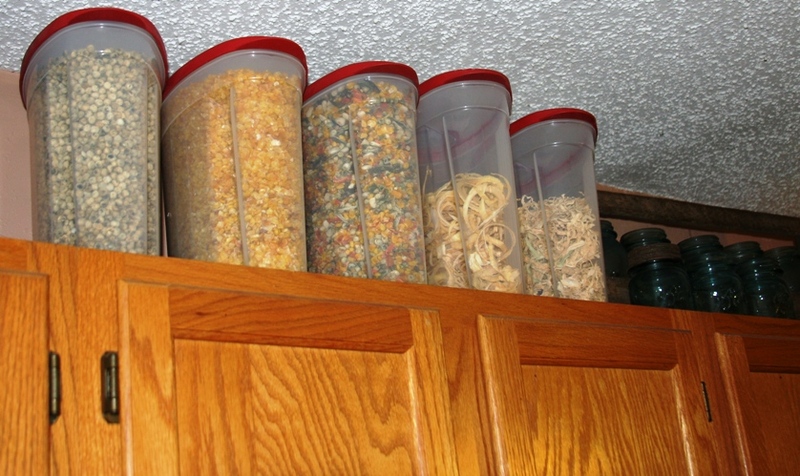 The second photo shows five Rubbermaid “Cereal Keepers” storage containers that I bought at Wal-Mart. They contain peas, corn, mixed veggies, onions, and cabbage. These are on top of my kitchen cabinets and are within easy reach when I am making a soup or a stew. The peas, corn and mixed veggies were one pound frozen bags that I bought when they were on sale at the local grocery store. Each of those three containers hold 8 bags of frozen veggies. The onion container holds 10 pounds of fresh onion slices and I haven’t finished filling that one or the cabbage container. I shop for sales and try to buy cheap. The booklet that came with my Excalibur was very helpful to me as a novice dehydrator. I also bought the book, “Dry it, you’ll like it” by Gen MacManiman. The book first printed in 1973, my edition is the 28th printing from 2000. There are so many examples in it, you won’t get bored. This entry was posted in canning & preserving, condiment and tagged corn, peas, peppers, veggies. Bookmark the permalink.